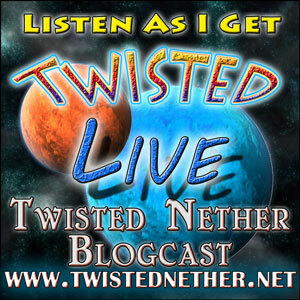 This Saturday, June 4th, Klepsacovic (that's me, btw) will be on the Twisted Nether blogpodwebcast thing. That's right, now you can hear my posts in the correct voice. As opposed to the current voice which I imagine is something between a whiny nerd and "Good news, everyone! You're now reading this with my voice!" Text ripped from their post! We are pleased to welcome Klepsacovic from Troll Racials are Overpowered . If you have any questions please make sure to send them in prior to showtime to info@twistednether.net or bring them to the chatroom! This live show is scheduled for Saturday, June 4th at 8pm PT (11pm ET). Rules? RULES!? Screw that. Er. I mean, please follow the rules. If for any reason you really must be rude, crude, and offensive, you can do that here. But you know, I'll probably delete those comments, because rude, crude, and offensive comments are what they are. "Outside of that, we will love to have you join us and partake in an enlightening discussion that is sure to follow! Hope to see you there!" So listen! Unless you're some lame-o like my friend who is all "I'm going to my sister's graduation." Right, like that makes sense. I bet she can graduate again. I did it three times already, and back in my day we didn't have those weird kindergarten graduations. Also I'm aiming for a fourth. My point is that you should listen. Hell, even I might. P.S. No offense, Buddha is the man. I'd fistbump him if he hadn't long ago achieved permanence and left this temporary life. P.P.S. Please softball questions only. No tough ones like "What is your plan to fix illegal immigration?" And no literal softball questions. And no favorite color! I hate that question. So, can we ask you questions here or do we have to do it there? You can ask here too, but to respond I'll have to suddenly shout over the interview. They might not like that. But I'm not in it to make friends. I'll just ask ya there. Make it look like I'm being legitimate.